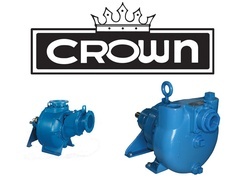 Crown Pumps, Manufactured by Crane, are designed for construction wastewater and dewatering applications. Users can same money by using these efficient and low operations cost self priming models. Unmatched performance up to 4,400 GPM (Gallons Per Minute) and head to 184 Feet and handling solids up to 3 inches or 80 mm. When you need a Crown Self Priming Pump in either close coupled, frame mount or v-belt drive configurations, look no further. We are here to help.